81st Academy Awards 2009 Supporting Actor Oscar Winner Heath Ledger as the Joker in "The Dark Knight"
"First of all, I have to say this is ever so humbling. Just being amongst such wonderful people, such a wonderful industry. I'd like to thank the Academy for recognizing our son's amazing work, Warner Bros. and Christopher Nolan in particular, for allowing Heath the creative license to develop and explore this crazy Joker character." 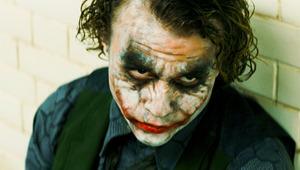 Heath Ledger portrays the Joker, a psychopathic criminal mastermind who will stop at nothing in his scheme to outwit and humiliate Batman in the movie "The Dark Knight." This is Heath Ledger's second Academy Award nomination and the first in this category. Heath Ledger was nominated for his leading role in Brokeback Mountain (2005). This Oscar nomination is posthumous, as he died January 22, 2008. Gotham City appears to be heading toward a relatively crime-free future, because of the efforts of Batman, District Attorney Harvey Dent, and Lieutenant Jim Gordon, and Bruce Wayne hopes he will soon be able to abandon his secret identity. However, the arrival of the terrifying Joker played by Heath Ledger, however, whose actions are motivated solely by his desire to outwit the Caped Crusader, forces Wayne to continue in his role as the city's best hope against the powers of evil. In "The Dark Knight," Ledger makes all other comic-book screen villains look like Baby Huey. Like Shakespeare's Iago or Richard III, like Anthony Hopkins' Hannibal Lecter or Javier Bardem's implacable murderer in "No Country for Old Men," this is no Method psychopath, asking or telling anyone about his character's motivation. At one point Ledger throws up his hands and says, agitatedly, that it's a waste of time looking for a rationale behind the Joker's smeary Insane Clown Posse makeup. "I'm a dog chasing cars," he says. "I wouldn't know what to do with one of them if I caught it." HEATH LEDGER (The Joker) was honored with an Academy Award nomination for his work in Ang Lee�s drama "Brokeback Mountain." For his performance as Ennis Del Mar, Ledger also earned Golden Globe, Independent Spirit, BAFTA and Screen Actors Guild Awards nominations, and won several critics groups� awards. In 2007, Ledger was seen in Todd Hayne�s "I�m Not There," for which he shared in a Robert Altman Award at the 2008 Independent Spirit Awards. Heath Ledger's previous film credits include "Candy," "Casanova," "The Brothers Grimm," "Lords of Dogtown," "The Order," "Ned Kelly," "The Four Feathers," "Monster�s Ball," "A Knight�s Tale," "The Patriot" and "10 Things I Hate About You," which first introduced the Australian-born actor to American audiences. Josh Brolin as Dan White in the movie "Milk"
Josh Brolin plays Dan White, the conservative former fireman who is elected to the San Francisco Board of Supervisors at the same time as openly gay politician Harvey Milk. Robert Downey Jr. as Kirk Lazarus in the movie "Tropic Thunder"
As Kirk Lazarus, Robert Downey Jr. plays a white Australian actor who has immersed himself completely in his latest role as an African-American soldier. This is his 2nd Academy Award nomination for Robert Downey Jr. and the first in this category. Robert Downey Jr. was Oscar nominated for his leading role in Chaplin (1992). Philip Seymour Hoffman as Father Brendan Flynn in the movie "Doubt"
Philip Seymour Hoffman plays Father Brendan Flynn, a progressive priest in a 1960s Bronx school who is suspected by its head nun of improper relations with a student. This is Philip Seymour Hoffman's third Academy Award nomination and the second in this category. Philip Seymour Hoffman won an Oscar for his leading role in Capote (2005) and was Oscar nominated last year for his supporting role in Charlie Wilson's War. Michael Shannon as John Givings in the movie "Revolutionary Road"
As John Givings, Michael Shannon plays a young man confined to a mental institution whose dinner with his parents' friends unleashes his relentless propensity for telling the truth. Anne Hathaway in "Rachel Getting Married"
Kate Winslet in "The Reader"
Mickey Rourke in "The Wrestler"
Pen�lope Cruz in "Vicky Cristina Barcelona"
Taraji P. Henson in "Benjamin Button"
Heath Ledger in "The Dark Knight"